Jordan Spieth talks to Justin Thomas on the second green during the Third Round of the 2015 BMW Championship. Updated: Alas, we won't get to see the trimmers come out. Justin Thomas took to Twitter to crush everyone's hopes and dreams of seeing the bet come to fruition. 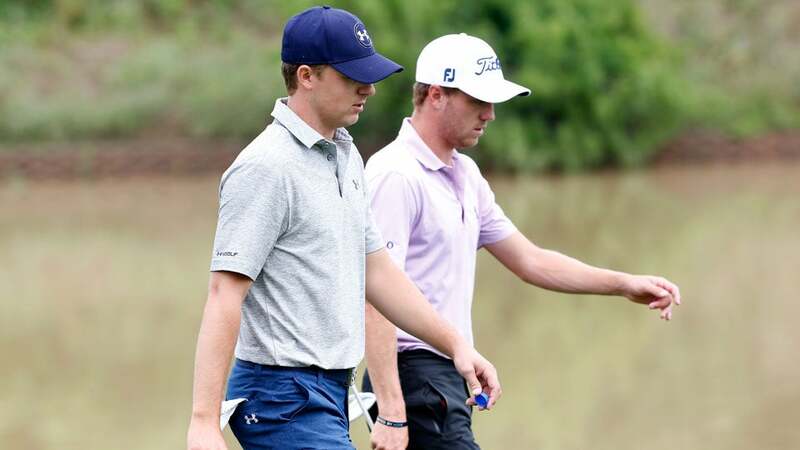 The bromance of Jordan Spieth and Justin Thomas continues. Pals Speith and Thomas exchanged tweets following the second round of the WGC-Cadillac Championship Friday, in which Spieth challenged the loser after Saturday's round to shave his head. Thomas, not to be outdone it, suggested it wasn't a bet either of them want to make. PGA Tour pros joined in to up the ante. @JustinThomas34 @JordanSpieth hahah yes!!!! I vote yes!!! #youwont!! And then things just got ridiculous. When you're not far up the leaderboard, you have to make it interesting. We'll definitely be keeping an eye out on their positions...and for the razors.